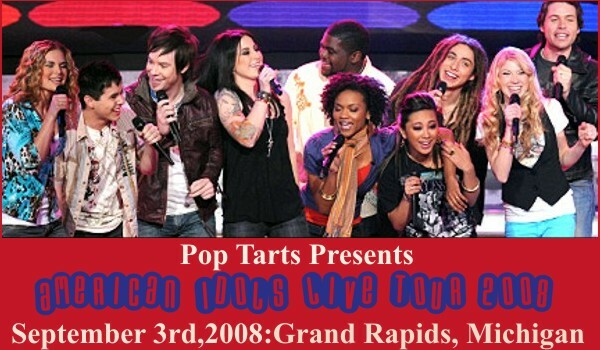 We know you are enjoying the Top 10 American Idol live show in the Van Andel Arena and hope that you have time to stop by and add some colorful recaps in the comments section of this blog topic. So, please share all your performance memories, photo links and video links with us. We love all the singers very much, so, we hope to see and hear many performance recaps of tonight’s show. You can also email me at masterclasslady@hotmail.com. Looking forward to hearing from you! Good morning everyone! From Grand Rapids in record time, “Angels”. Oh my, David must have heard about my new found affection for “street” and decides to give me a little more. I also enjoyed the elongated waterfaaaal and the second to the last “angels” is particularly strong and vibrant. If the less than perfect visual becomes to much for you just sit back and close your eyes. I found myself completely lost in his ohh, ohhs and yah yah, yahs. IMHO, Apologize sounds as strong and forceful, maybe it’s youth, maybe a good night’s sleep but I believe he sounds better than ever. If SBM comes up, I’ll be back. And here is SBM. Again another golden nugget of Archuleta Artistry in this performance. In the second “I won’t cry” I believe David hits a new high in the ascending (this is so much fun!) vowel in wooooon’t. I also think the permanent lyrical change to “in denial” is a good one. Thanks Janey for posting these — I have learned to wait until the morning! David sounded fantastic last night and I am relieved. In denial -this is so much better– I was actually a bit startled the first time I heard him sing the fuller version of the Beautiful girls part on the tour – just did not seem right coming out of him. I hope no one made him feel bad about it though. Does anyone know specifics on when/why the change occurred? Thanks so much Janey! Whew! I am relieved that David’s voice is back on track. I cannot wait to watch these videos tonight. I have to teach some voice students in a bit, so I will comment more later. Archiefandoc, If you desire I could research the specifics for you on the lyric change. It would be a labor of love and I would be happy to do it tomorrow. In general it was rumored that his mother requested it. I know for certain he changed it for the shows in Utah, then back to the original. I believe it was one of the shows in Georgia with family present, he said “in denial” then slipped and combined “suicidal” and “in denial”, although it could have been Tulsa. Thanks Janey – I will have to go find the UTAH videos, and Georgia videos. any lurkers on this sight late at night????? ++incentive++ I donated an autographed Idol Live program book to be given to randomly selected donor – no amount to small – or too large! Although “Angels” is posted above I wanted to share this one as well. The audio is not as good as the first one but the visuals are spectacular. MCL, I’ve had a question about “Angels” for some time that I can’t resolve on my own, so it time permits I’d like your thoughts. A few concerts back David dropped the yayayaaas and replaced them with ohohooos, now we are back to the more familiar yayayaaaas, which I love. Tell me, did you favor one over the other? I wasn’t sure if it was the unfamiliarity of the change but imho, it seems to flow better with the original combination. Happily lost in my angelic thoughts of ohohoos and yayayaas I forgot to post the link, sorry! OH what a relief to finally be able to log on….I was in crisis last night when the site wouldn’t let me!! Have a great weekend, MCL! Actually, Janey, I prefer the oh oh -ya ya combo. As I have said in my reviews of “Angels”, the combo adds more color and dimension to this part of the song. Also, I think the “y” consonant may have caused him to tighten his facial muscles just a tad. So the “oh” vowel was vocally liberating for him – his voice just soared and then when he added the “ya ya” followed by more Ohs”, his voice was focused where he wanted it. Hope this helps you to understand why he may have selected to run with this option. I can’t verify this, of course, I am just speculating. Whatever the reason, it was a good ,intelligent technical decision. Hope you are having a great weekend as well. Will have a listen to the links in a little while. Thanks for adding them. Woops – I haven’t listened to any of David’s yet. Darn – my site was a technical disaster last night and I forgot about all of these links. Hopefully, I will get to all of them. I’ll try my best – if not tonight, then tomorrow. Janey and ReReader – I will review the links tomorrow. I need to get some sleep. Thanks for your patience.